Last week, I stumbled upon an article in Inside Higher Ed (Alexandra Tilsley, “Grading Clout?“, 30 Aug. 2012) highlighting Todd Bacile, a Florida State University instructor, who uses Klout to assess his digital communication students. On the surface, this technique seems to open doors to creative assessment. However, dig a little deeper and some big questions begin to emerge about what students are actually learning. I am a Klout user. I have a high-ish score (68), and receive frequent inquiries based on my number. Here’s the secret: in a lot of ways, that score is completely bogus. 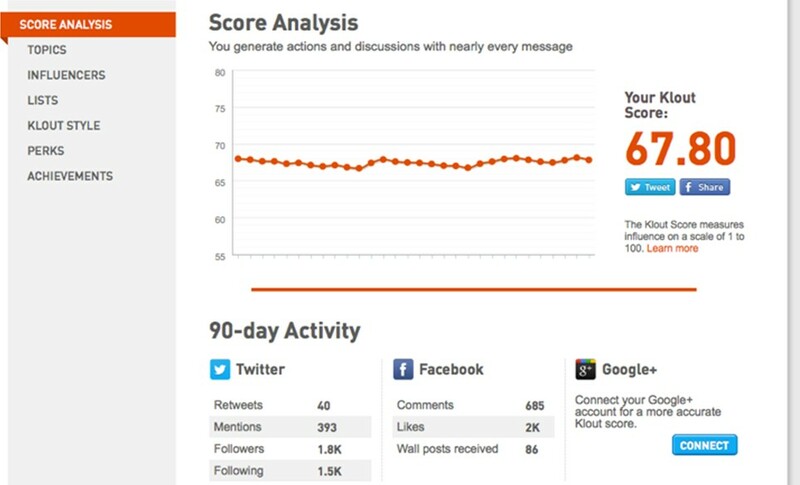 As you can see, my Klout score remains relatively steady, and my number is high. At a glance, it would appear that I am social media-savvy, with frequent re-tweets and conversations started. This is not completely incorrect. I am relatively social media savvy, and I start a lot of conversations about education, social media, and the career cycle. These are my interests, and at the risk of sounding boastful, I am experienced and knowledgeable in them. So, given this data, I would probably do relatively well in a high-level assessment. Now, let’s dig a little deeper and I’ll reveal my true social media identity. According to Klout, I am influential in 20 topics. See, Klout is pretty easy to punk. One day, I tweeted about the drama llama. Klout said I was influential in llama. Many friends bestowed +K in llama upon me. It is now, according to Klout, my greatest area of expertise. See also: unicorns. Now, there are real subjects on this list, too. I am a huge advocate for the city of Lansing and the state of Michigan. I volunteer many hours to making these places successful. But how would you know that, based upon this list? 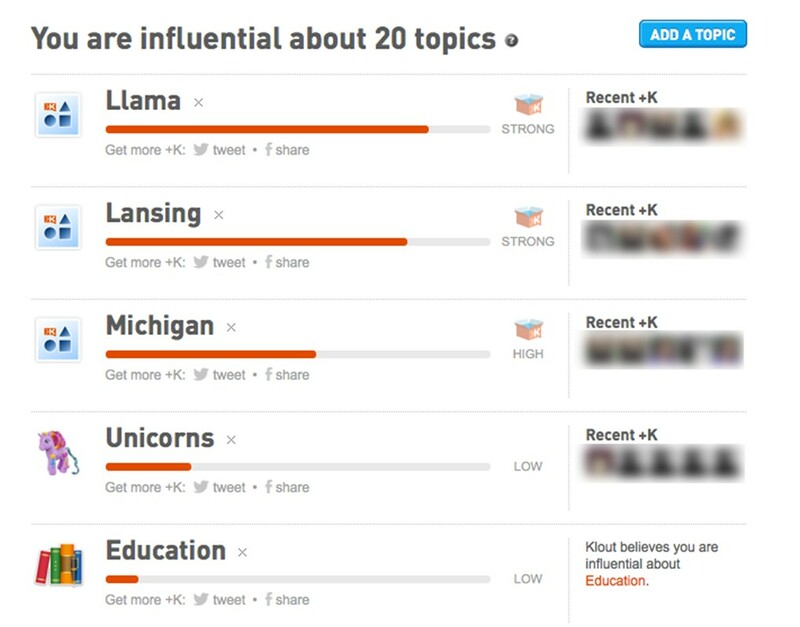 If I’m so influential in llama and unicorns, am I truly influential in Lansing and Michigan? The +K is a fickle indicator. It is also easy to punk. 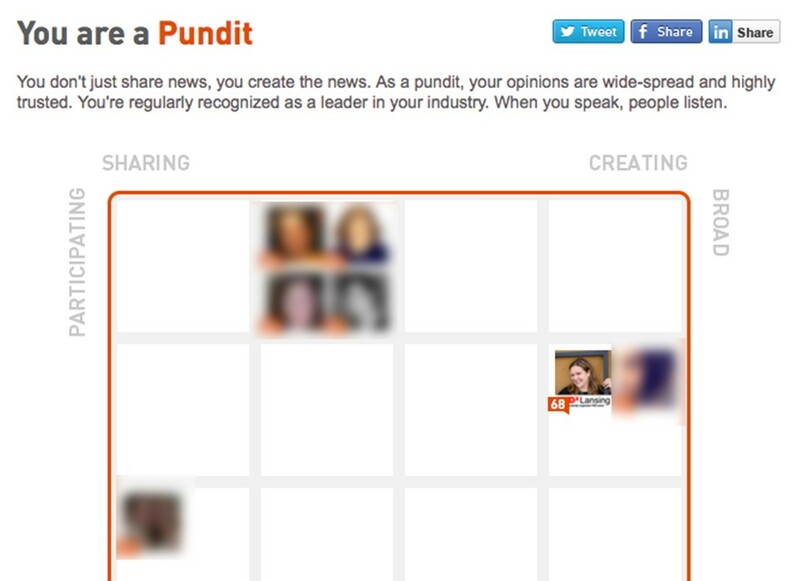 As you can see below, Klout rates me as a “pundit.” I create news. Would we call this creating news? Or would we call this being silly with my friends on Twitter? Starting conversations, certainly, but how would you assess the quality of these conversations? Would you? My Klout score shows me the following: I have funny friends and tend toward the goofy end of the spectrum. It is important to note, however, that much of this is my own making. Let me be clear: I do believe that Klout offers interesting options for grading and engagement. More importantly, however, I believe that Klout offers us a way to understand who we are in the digital world by evaluating how we see ourselves and how others see us. I am curious to see how Bacile’s students fare and how they adapt to the grading. Will they punk Klout for a better grade? Will they receive extra credit if they figure out how to do so? In some ways, it could be argued that this shows a heightened understanding of digital marketing, could it not? Will they trade +Ks with classmates? If so, how will that be evaluated? I am fascinated by the ways students have already tried to raise their scores, as outlined in the article. What does it mean, though? What do you think about Klout? Do you find it a useful metric? What tips do you have in regard to its use or usefulness? If you were Bacile, how would you assess student success? That’s my problem. I don’t post pictures of my dog. If I did, Klout would recognize that I am an important education researcher. Phenomenal! Todd Bacile just reached out via Twitter! He’s posted a follow-up, and there is some in-depth research coming! Stay tuned for more on this topic!